The blade is made of S30V stainless steel and is a high ground, drop point blade with a shiny, polished finish. The G10 handle has been hand-blended and contoured, and its dark green color allows it to blend with the bush. With a sturdy, full tang as well as a 4.4 inch cutting edge, the blade holds up beautifully and is extremely durable. All around, this is a fantastic looking product by Benchmade up for review. First, we must address the design and build quality. The Benchmade Bushcrafter is styled after the Cascadia Bushcrafter Knife, lending it a beautiful, ergonomic form. The handle is made of molded G-10, held together with titanium tubing, squeezing the handle against the tang and adding strength to the construction. The red spacers used in the handle help offset the tang and the handle. The handle has a noticeable bulge near the middle, which allows for a better grip. This grip allows you to be much more effective when you are attempting to chop wood, slice shavings, or even hold it tightly to strike a flint rod. The blade steel choice is excellent. S30V is a premium stainless steel often used in high-end folding pocket knives, but not as commonly found in fixed blade survival/bushcraft knives like the Benchmade Bushcrafter. S30V is a very tough, rust resistant, easy to sharpen blade steel that is capable of holding an extremely sharp edge with excellent edge retention. Many users have found the Bushcrafter a solid, reliable blade. The build quality is so good that it allows you to strike firesteel to start your fire, as well as cut wood to feed the fire without losing its razor sharp edge. The stainless steel blade fits snugly in the tooled buckskin leather sheath. It comes with a D-ring to fit on your belt, as well as a flint rod loop that fits standard Army-size flint rods. The blade is also very easy to sharpen and keeps a razor sharp edge through a lot of abuse; users have found that the blade can even bend or deform and will easily go right back to its original straight shape. There are virtually no negative attributes I can identify with the blade itself. However, a few users of the Bushmaster have complained about the sheath and lack of texture on the handle. Some have found that they need the extra texture for a secure grip on the handle during typical woodsman activities and the Bushmaster does have a fairly smooth surface. This can be a danger to the unprepared and Benchmade could have done a better job when designing the handle texture. That said, I find the actual shape of the handle provides plenty of grip on its own and the finger guard insures your hand will not slip forward into the cutting edge, so safety is of no concern as long as you are handling the knife properly. The sheath has other potential issues. First, it makes the knife ride very high on the belt with the handle protruding more than I would like. However, this is typical for many Benchmade products and the issue can be easily fixed with an additional D-ring loop if you want it to sit lower down on your belt. Second, the sheath really does not hold the blade tightly enough for extreme activities, running the risk that the knife will slip upwards, potentially exposing the blade’s edge to your side. Just be sure to use extra caution when sheathing the knife and be certain that the blade is fully seated and the security strap is fully fastened. For a first foray into the world of bushcraft and survival, Benchmade has certainly struck a winner. The full tang construction offers added durability which is absolutely essential when you’re looking for a trusty companion on your bushcrafting missions. Though the buckskin sheath has some issues, they can be easily fixed and the blade fits tightly in the sheath, allowing you to carry your Benchmade knife into the wilderness with very little concern. The Benchmade Bushcrafter is definitely a must own for anyone needing a high quality, sturdy and reliable bushcraft blade that will tackle most cutting and chopping tasks while lasting for many years to come. A seriously durable knife that you will likely be able to pass down to your kids or even grandkids. Overall, the Benchmade Bushcrafter 162 is a fantastic performing, sturdy bushcrafting knife that should serve you well in your wilderness endeavors. The thick, sturdy blade resists chips and S30V stainless steel sharpens easily. Edge retention is phenomenal. Comparing it to inexpensive carbon steel Moras knives, as well as the Bear Grylls Ultimate Survival Knife, I would choose this stainless steel blade every time for typical bushcrafting needs. Of course taking value into consideration that may change when you realize how much more that premium S30V steel and other high end build materials raise the price of the Bushmaster, which hovers around $180. Certainly not cheap but those who do layout the extra money are rewarded a stunning knife with superior fit and finish. 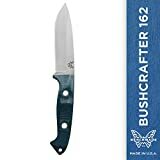 Would I recommend the Benchmade Bushcrafter? If you’re an avid knife enthusiast or the type who doesn’t focus on value and only wants a premium product, definitely. But this knife won’t be for everyone. You could probably reach 90% of the Bushcrafter’s performance for half the price from other popular brands and still receive a very high quality knife. Just depends on your priorities and whether you can afford to drop nearly $200 on a premium bushcrafting knife. My guess is most fans of Benchmade will fall head over heals for the Bushcrafter, price be damned.